At some point during the next USHL season, the Omaha Lancers and Des Moines Buccaneers are going to meet. Des Moines center Max Gardiner is going to chase a puck into the Omaha end, where Lancers defenseman Justin Holl is going to meet him. There will be a collision when those two big, fast bodies collide. In fact, that collision will be about a decade in the making. That's because it'll be the first time since the pair started playing hockey that they'll be on opposing teams in a competitive game. "They're both real hard competitors, so it'll be interesting," Minnetonka (Minn.) High School hockey coach Brian Urick told NHL.com. Gardiner and Holl both were born in Edina, Minn., played their youth hockey in Minnetonka and have been teammates for four years with the Skippers. Holl, a 6-foot-2, 170-pound defenseman, had 17 goals, 31 points and only eight penalty minutes in 25 games. NHL Central Scouting has him at No. 47 on its final ranking of North American skaters for the 2010 Entry Draft. "He's got a real big offensive side to him," Urick said. "He likes to go with the puck and he's real smooth. Doesn't look like he's moving very fast, but his stride is so long and he gets around the ice real well. His endurance is really good. He can go forever. He doesn't like to be taken off the ice. He's like a forward playing defense." Gardiner, a 6-3, 176-pound center, had 17 goals and 43 points in 17 games. He's No. 49 on Central Scouting's list. "He's a big kid, uses his body really well to protect the puck," Urick said. "He's got great hands and he's a competitor. No one ever outworks him when he's on the ice. He's trying to win every battle. He's got that hard-nosed attitude and with the skill, it makes him into a great player." Both players were finalists for the state's prestigious Mr. Hockey Award, and helped Minnetonka reach the state finals. It was the culmination of a great time growing up and playing together for the pair. "We know each other since we started playing youth hockey, since were 7 or 8 years old," Holl told NHL.com. That run will take a one-year hiatus next season. They'll play together again at the University of Minnesota for the 2011-12 season, but prior to that, they'll each play a season in the USHL. "It's going to be weird playing against him next year," Holl said. "Should be different and should be fun to kind of battle a little bit with him," Gardiner told NHL.com. Before they separate, they'll have the draft experience to go through together. "We can talk about what's going on," Gardiner said. "It makes you feel a little more comfortable being here with a good friend. It helps." 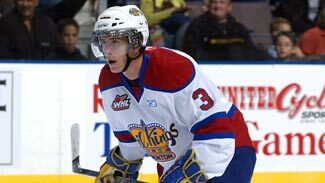 They also got help from Max's older brother, Jake, who was the 17th pick of the 2008 Entry Draft. Jake was a senior at Minnetonka when he was drafted, and watching him go through his draft season definitely made an impression on Max and Holl, who were sophomores. "It was good because we were competing against an NHL draft pick in practice, which is a special thing when you're a sophomore in high school," Holl said. "He set the bar for what everyone wanted to be. I think all of us just want to achieve as much as Jake Gardiner did and push as hard to get there because we know it's realistic. We know it could happen." "He's been great for me growing up," Max said. "I watched him go through everything and what it took to get there. He's paved the way, showed me what it takes. He's always there for me." Holl and Gardiner won't have each other to lean on for support next season; instead, they'll be competing against each other for the first time. "Hopefully they don't go against each other too much," Urick said. "They're good friends, but I wouldn't be surprised to see the two of them give each other a few hacks here and there."